A vegetarian diet is a diet that does not include meat, fowl, seafood or any products containing these foods. There are a few types of vegetarian diets. A lacto-ovo-vegetarian diet, for instance, is based on grains, vegetables, fruits, legumes (beans), seeds, nuts, dairy products, and eggs. Vegan diets, another form of a vegetarian diet, exclude all animal products including eggs, dairy, and anything else of animal origin such as honey. For people with type 2 diabetes, following a vegetarian diet may seem a bit tricky because excluding animal products like meat, fish, and fowl can limit protein options. While it may seem appropriate to eat a higher protein diet because they tend to be lower in carbohydrate, it is possible to eat a vegetarian diet and maintain a healthy weight and blood sugar control. In fact, some may argue that a vegetarian/vegan diet is better because researchers have found a link between type 2 diabetes and intakes of red meat, particularly processed meat like bacon and hot dogs. Other studies indicate that vegetarian and vegan diets can improve plasma lipid concentrations and have been shown to reverse atherosclerosis progression. A vegetarian diet is rich in vegetables, legumes, whole grains, nuts, and seeds. The American Academy of Nutrition and Dietetics position statement reports that higher intakes of vegetables, whole-grain foods, legumes, and nuts have been associated with a substantially lower risk of insulin resistance and type 2 diabetes, and improved glycemic control in either normal or insulin-resistant individual. 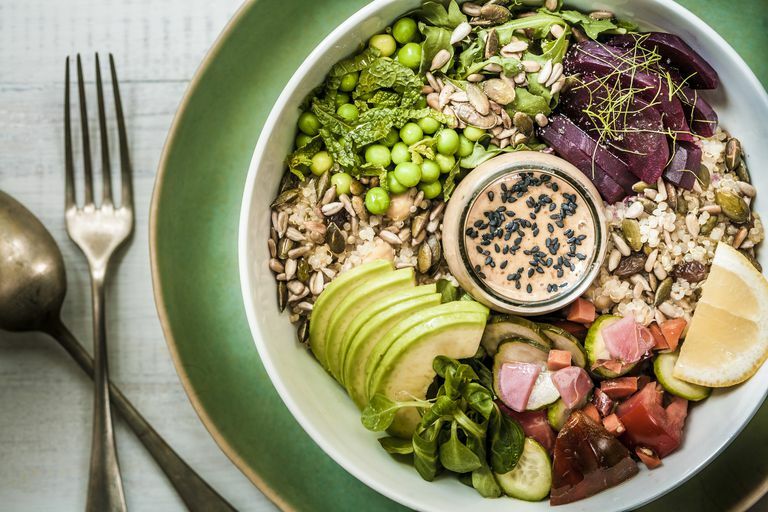 The key to eating a vegetarian diet when having diabetes is to make sure you eat adequate amounts of protein and healthy fat and choose high fiber carbohydrates that are portion controlled. When it comes to diabetes, protein is an important nutrient; it boosts immunity, aids in satiety and slows down digestion which can help to regulate blood sugars. Typically when we think of protein, we think of turkey, chicken, fish, and meat, but vegetarian-based foods also contain protein. The American Academy of Nutrition and Dietetics states that plant protein can meet protein requirements when a variety of plant foods is consumed and energy needs are met. Plant-based protein includes beans, nuts, seeds, whole grains like quinoa, barley, and bulgur. Lacto-ovo-vegetarians can also get protein from eggs and yogurt. The key is to make sure you eat a variety daily and that you have some protein at each meal. Some studies have shown that people who follow vegetarian diets see reductions in their bad cholesterol. Perhaps this is because vegetarian diets are generally rich in polyunsaturated n-6 fatty acids, fiber, and plant sterols and low in saturated fat found in animal products like beef and processed meats. On the other hand, vegetarian diets can be lacking in omega-3 fatty acids—especially those that exclude eggs and fish. Studies have shown that omega-3 fatty acids are important for heart and brain health. Type 2 diabetes can increase your risk of cardiovascular disease, therefore keeping a healthy heart is important. If you do not eat eggs or fish you may need an omega-3 supplement (DHA/EPA), but you can also get some of these healthy fats from fortified soy milk and foods rich in alpha linolenic acid, a plant-based n-3 fatty acid like flaxseed, walnuts, canola oil, and soy. Studies show that vegetarians consume between 50 to 100% more fiber than non-vegetarians. A high fiber diet helps to regulate blood sugars, lower cholesterol and achieve fullness. Legumes and whole grains contain slowly digested carbohydrate and are rich in fiber which may help to improve glycemic control. It is important to monitor your intake because carbohydrates are the macronutrient that impact blood sugars the most. Generally, 1/2 cup of beans, 1 small potato (size of a computer mouse), 1/3 cup of a cooked grain (variations may apply depending on the grain) contains about 15 to 20 grams of carbohydrate, therefore you cannot eat unlimited amounts. Learning how to carbohydrate count will help you achieve good blood sugar control. Depending on what your carbohydrate allotment is for meals, you can adjust your intake accordingly. You can also use your glucose meter as a resource for testing how your body responds to certain foods combinations. In order to achieve a recommended hemoglobin A1c of 7% or less, the American Diabetes Association states that your blood sugar be 180mg/dL or less two hours after a meal. If when you test your blood sugar two hours after your meal, your number is consistently above this goal, you may be eating too many carbohydrates at your meals. Discuss this with your diabetes educator or registered dietitian so that you can adjust your meal or medicines accordingly. Before changing your diet, it is always important to speak with your healthcare provider. If you are considering switching to a vegetarian diet, you should meet with a registered dietitian. They can help to individualize a meal plan to fit your carbohydrate, protein, vitamin, and mineral needs. Depending on what type of vegetarian diet you decide to follow, you may need to take supplements for nutrients that you may be lacking, including iron, zinc, iodine, calcium, vitamin D and B12. Your dietitian can also teach how to increase absorption of certain nutrients by pairing foods as well as cooking techniques. Barnard ND, Katcher HI, Jenkins DJ, Cohen J, Turner-McGrievy G. Vegetarian and vegan diets in type 2 diabetes management. Nutr Rev 2009; 67:255-263. Willett WC. The role of dietary n-6 fatty acids in the prevention of cardiovascular disease. J Cardiovasc Med (Hagerstown). 2007 Sept;8 Suppl 1:S42-5.